The Chief of security for Petramco International's African Region was fired this week after his military security force, the Petramco International Security Service Overseas Force (PISSOF) was routed in a battle with Ztumsian forces. The newly raised PISSOF forces lost four tanks in the battle and abandoned the Petramco complex at Bontaga to a column of Ztumsian troops from the People's Army for the Nation and Tribes of Ztumsia (PANTZ), supported by security troops from the Special Armed Police Service (SAPS). PANTZ forces advanced towards the Botanga fruit processing plant which was guarded by a strong PISSOF force of four tanks, mercenary infantry and impressed militia last Wednesday (July 18, 1979). 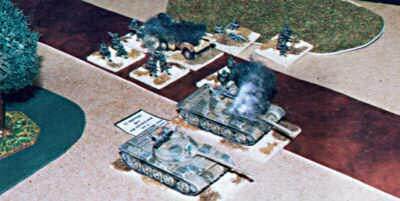 The PISSOF tanks are understood to have abandoned their defensive positions to launch a counterattack which, badly coordinated and unsupported by infantry, came to grief under the gunfire of a force of PANTZ infantry supported by two tanks and an airstrike by the Ztumsian Airforce (ZAF). By nightfall PANTZ and SAPS troops had seized control of strategic positions overlooking the Petramco plant and the PISSOF forces retreated in total disorder. PISSOF tanks attack the PANTZ lines. Within minutes the two surviving tanks had been destroyed. The Ztumsia government claims that Petramco has been evading taxes for several years and has passed laws allowing it to confiscate all Petramco assets in the country until the debt has been settled. Petramco International, a multinational conglomerate with oil, mineral and food interests all over Ztumsia/Setumsia spent three months and several hundred thousand pounds setting up PISSOF after their previous security arrangements, under which troops from the Ztumsia Irregular Tribal Spiritualists guarded their installations, were found to be completely inadequate. Forces from the Army of the Republic of Setumsia (ARSe) clashed with of troops from the Ztumsian Independent Tribal Spiritualists (ZITS) this week in a densely forested area of South Eastern Setumsia. The ARSe column retreated after meeting heavy resistance.